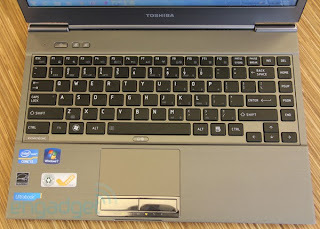 Toshiba should know a thing or two about skinny, featherweight laptops. Back in 2007, the company unveiled the Portege R500, a 2.4-pound laptop measuring what was then an anorexic 0.77 inches (19.6mm) thick. Much to everyone's disbelief, it managed to squeeze in an optical drive. Fast forward four years and it's entering the Ultrabook market with the Portege Z830 (that's the Z835 if you get it at Best Buy). And here comes the déjà vu: it's even lighter than the competition, at 2.47 pounds, but still houses a full suite of ports, including USB 3.0 and 2.0, HDMI and Gigabit Ethernet. It also promises more than eight hours of battery life, besting claims made by the likes of Apple, Acer and ASUS. Not to mention, with a price of $800 (Best Buy only), it undercuts competing models -- and at a time when every other Ultrabook seems to have some fatal flaw, whether it be a flaky touchpad or skimpy battery life. Clearly, there's lots of room here for something more carefully thought-out. So is Toshiba's Portege know-how just what the market needs? Let's see. For a machine that's going to sit on the shelf at the Best Buy, the Z835 looks like it would be more at home under the arm of some suited, late '80s businessman. We're not sure if it's the drab black-on-gray color scheme, the chintzy chrome accents or some combination thereof, but put together they make for a design that's at once dated and stuffy. It doesn't help that there's a lot going on here: in addition to the power button, the area above the keyboard is home to two launch keys, including ones for Intel Wireless Display and Toshiba's eco utility (more on that later). There's also a thin strip below the touch touch buttons that houses six LED lights that glow green and orange. Wedged in between the space bar and the touchpad is a button for turning off the trackpad. In a quirky touch, the fan sits on the bottom side, protruding ever-so slightly. The hinge, meanwhile, has a metal shoulder on each end that matches the reflective material used in the touch buttons. That wouldn't be so noticeable if it weren't for the fact that there's thin cutout above the hinge in both those spots, putting about an eighth of an inch of blank space between the hinge and the corners of the display -- an optical illusion that fools you into thinking the screen is sitting higher than it is. As a finishing touch, the palm rest comes plastered with four stickers. You can remove these, of course, though we wish more OEMs would paint them on the bottom, as Lenovo did with the IdeaPad U300s. 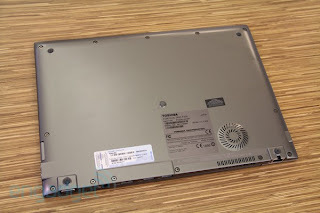 It's a shame because in a blind hands-on, the Z835 feels exactly like we'd always hoped Ultrabooks would feel. At 2.47 pounds, it's almost half a pound lighter than the Air, and believe us when we say you can feel the difference. What's incredible, too, is that despite being so featherweight the Z835 still crams in more ports than anything else we've seen. These include a USB 3.0 socket and Kensington lock slot on the right; an SD reader and headphone and mic ports on the left; and a buffet of openings 'round back that includes twin USB 2.0 ports, Ethernet, HDMI, VGA and the power port. Of those USB 2.0 sockets, one of them uses Toshiba's Sleep and Charge technology to charge gadgets while the laptop's dozing fitfully. The only Ultrabook that come close to this kind of spread is the new HP Folio 13 and, as it happens, it's also the heaviest of the bunch, at 3.3 pounds. Otherwise, almost every Ultrabook is missing something. The 13-inch MacBook Air has two USB 2.0 ports, an SD slot and a Thunderbolt port, for which there aren't yet many compatible peripherals. The ASUS Zenbook UX31 has USB 3.0 and 2.0, mini-HDMI and mini-VGA, and comes with Ethernet and VGA adapters. The U300s, meanwhile, has HDMI, USB 3.0 and 2.0, but no SD slot or Ethernet jack. Finally, the Acer Aspire S3 -- one of Toshiba's main competitors at this price point -- houses two USB 2.0 ports, as well as HDMI-out. With lightness, though, comes mixed build quality. Although the Z835 is made of magnesium alloy and has the same honeycomb caging you'll find inside other Porteges, it feels less solid than other the Air or UX31. When you grip it in one hand, the whole thing feels sort of hollow, especially as you press your fingers into the bottom side. We also noticed the lid wobbles, especially after you set the laptop down. Then again, that brushed metal casing proved immune to both scratches and fingerprints, so however flimsy it felt, we never felt compelled to handle it with kid gloves. 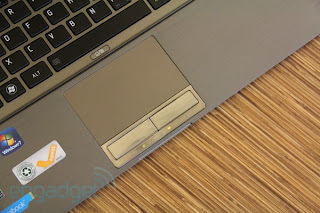 The Z835's keyboard is on par with those belonging to some of the other Ultrabooks we've tested, but that isn't exactly saying much. As with so many other chiclet arrangements, the keys here don't offer much travel. Worse, still, each individual key has a squat shape, leaving barely enough vertical space for even small fingertips. Suffice to say, that didn't stop us from typing portions of this review (and with few spelling errors, at that). We suspect you'll adapt, as people often do to imperfect keyboards, though we'd remiss if we didn't warn you that there's a learning curve. 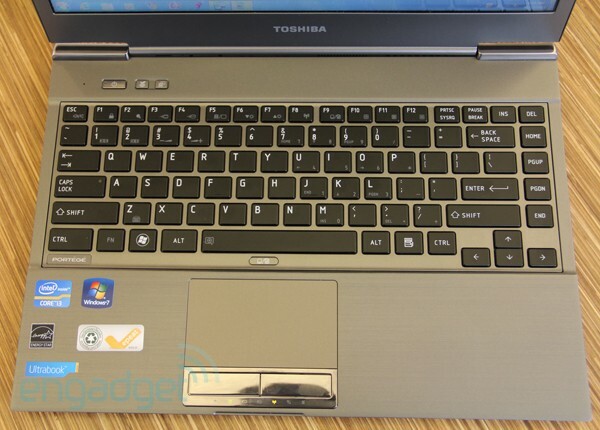 Still, Toshiba wisely extended the keyboard from one end of the deck to the other, wasting very little space on the sides. As a result, most of the major keys -- Enter, left and right Shift, Caps Lock -- are amply sized and easy to hit if you're touch typing. (Others, such as the Fn and right Ctrl buttons, have been reduced to the size of a fingernail, and are no larger than any of the lettered keys.) The typing here is also pretty quiet, with the keys making a comforting, low-pitched sound. Another bonus: it's spill-resistant, showing Toshiba is indeed putting its business-centric Portege expertise to good use here. The Z835's keyboard is also backlit -- not too shabby, considering the $900 Acer Aspire S3 doesn't have this feature (the $900 HP Folio does, however). Not to look a gift horse in the mouth, but we noticed it isn't particularly bright. If you sit on the side of the laptop (you know, away from the keys), you'll see white lights glowing beneath the buttons. To Toshiba's credit, the backlighting does become more obvious as your surroundings get dimmer, which means it'll come in handy the next time you attempt to work through an overnight flight. But even then, the lighting feels more subtle than what you'll see on the Folio or Air: you're not going to see white light pooling beneath the keys; just a faint glow from the keycaps, leaving you with barely enough of a glow to type in the dark. The 1.75 x 3.3-inch touchpad, though short, offers a smooth, low-friction surface that makes it easy to drag the cursor across the screen -- nope, no lag or jumpiness for once. It even pulls off pinch to zoom reasonably well. The problem is that the pad is small enough that you'll have to angle your hand just so in order to have enough room to stretch those fingers out. Even then, you'll likely feel your fingertips bump against the edges of the trackpad. It also supports one- and two-fingered scrolling, but for whatever reason, neither gesture is enabled out of the box; you'll have to go into Synaptics' device settings and select these options yourself. The two touch buttons should serve as evidence that sometimes, a staid design can have its advantages. Yes, those buttons are made of a tacky reflective metal that collects your oily fingerprints. But there's something to be said for not having to put up with a touchpad with a built-in buttons -- you know, the kind we often rail on for being too flaky. Here, the buttons are reliable, easy to press and fairly quiet. 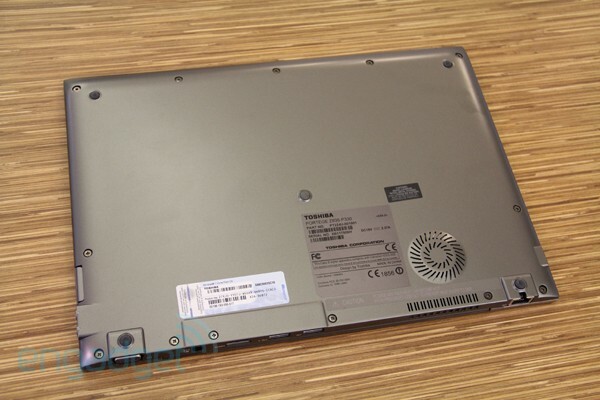 Like every other Ultrabook offered at this price, the Z835 has a 1366 x 768 display. We figure, if more pixels are a necessity, you shouldn't have any qualms about spending an extra three hundred bucks on the UX31, which comes standard with a 1600 x 900 panel. As for everyone else, that 1366 x 768 pixel count should be enough for checking email and scrolling through webpages. So our real gripe about the screen actually has very little to do with specs but, rather, the quality. Granted, TN displays in general don't offer great viewing angles, but they seem particularly narrow here. If you look at the display head-on with the brightness cranked up, you'll enjoy pleasant colors and crisp-enough detail. Dip the lid forward, though, or watch from the sides and you'll see the picture become washed out with more severe contrast. As with so many other displays we've tested, it's adequate, but you will have to remember to adjust the screen carefully before settling in for your next True Blood marathon. Toshiba also threw in its Resolution+ technology, which promises to upscale video to as high as 720p. While it doesn't hurt to have this feature, it's more of a marketer's bullet point than anything else. For one, you can only use it in Windows Media Player 12, which means this won't compensate for the amateur quality of home videos on YouTube and Vimeo. Even when we used it in Windows Media Player, though, we didn't notice much of a difference. Grainy videos looked as pixelated with ever. Here's your first clue that audio quality wasn't a top priority for Toshiba here: the volume controls are built into the "3" and "4" buttons, while the main row of function keys is given over to things like locking the computer, going into hibernation, adjusting the brightness and disabling the touchpad (an odd thing when there's also a discrete button for that). Oddly, too, there's no onscreen indicator showing the volume level as you adjust it. As it turns out, the sound quality is fairly ho-hum, though volume is the least of its failings. 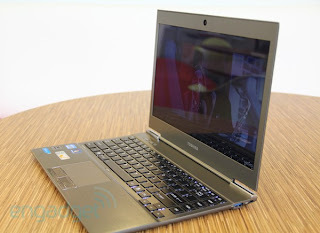 It's not as loud as, say, the Bang & Olufsen-equipped UX31, though it's on par with other Ultrabooks, such as the U300s. No, the real weakness is the way tracks sound -- and that's despite MaxxAudio software on board to help enhance the quality. Pop songs by the likes of Lady Gaga sound alright at median volume settings, but they take on a distant, metallic quality as you pump the volume. Rap tracks and more bass-heavy numbers are predictably thin as well. We're willing to bet that with a 23-second startup time, some of you won't fret too much about the raw performance scores. The $800 configuration we tested sports a 1.4GHz Core i3-2367M processor, 4GB of RAM, a 128GB SSD and an eight-cell battery rated for 8.28 hours of runtime. Given its price, it performs well. Thanks in part to its Hi-Speed Start technology, it boots in 23 seconds -- almost half the 45-second startup time we observed with the similarly priced Aspire S3. Its benchmark scores are higher across the board, too: it notched a 500-point lead in PCMark Vantage and a nearly 400-point gain in 3DMark06. And, as you'd expect, the Z835's SSD offers much faster read speeds than the 5,400RPM hard drive that comes with the entry-level S3. In the disk benchmark ATTO, the Z835's mSATA drive managed read speeds that peaked just below 200 MB/s, while the S3 topped out at 80 MB/s reads. For our part, the Z835 didn't get in our way while we worked (actually, it did sometimes, but that's a function of the obnoxious bloatware load, which we'll tell you about in a bit). During our testing, we carried on our normal routine of juggling tabs in Chrome, writing emails, reading blogs and streaming YouTube videos. The machine didn't hiccup, even when we started downloading and installing programs and running a full system scan in the background using Norton Internet Security. We did notice a slight lag as we opened a new tab while playing a web video, but other than that, multitasking was smooth. 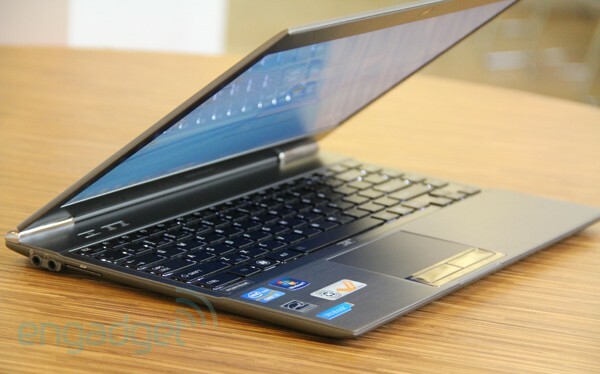 The best we've seen so far in an Ultrabook -- albeit by a margin of just eight minutes. In our rundown test, which involves looping a movie off the hard drive with WiFi on and the brightness fixed at 65 percent, it lasted five hours and 49 minutes. If you were to buy the identically priced Acer Aspire S3 you'd have to settle for an hour and 40 minutes less runtime (ditto, more or less, for the $1,349 Samsung Series 9). Still, though it's technically the best, the Z835's longevity is comparable to the Zenbook UX31 and, to a lesser extent, the MacBook Air. Needless to say, we'll be curious to pit this against the HP Folio 13, which costs the same and is rated for nine hours of use. We know, we know: battery life ratings are often exaggerated bunk. That said, we wouldn't be too surprised if we soon had a new battery life champ. This is probably a good place to explain that eco utility we mentioned earlier. Though it looks like a dashboard showing the display brightness and power consumption, in practice it's just a pre-configured battery-saving setting. So, if you enable eco mode, the keyboard backlight turns off, the display dims and the system will turn off the screen and hard disk sooner than it normally would. From what we can tell, it's an app dedicated to flipping on one particular power management profile: there are some advanced settings, but so far as we can tell, you can't adjust any of those metrics (at least not here -- you'll of course get more options in Windows Power Options). And though it's interesting seeing the real-time graph illustrating the power consumption, we suspect that's not what most consumers will use this utility for. 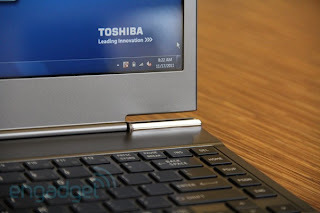 Toshiba loaded the Z835 with bloatware, but in an interesting twist, most of it's software the company wrote itself. 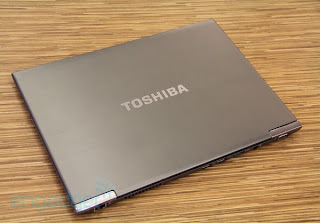 These programs include: Toshiba Assist, Disc Creator, DVD Player, Face Recognition, Fingerprint Utility, HDD/SSD Alert, HDD Protection, HW Setup Utility, Media Controller, Password Utility, PC Health Monitor, Recover Disc Creator, Service Station, Security Assist, Sleep Utility, Value Added Package and the laptop's webcam software. 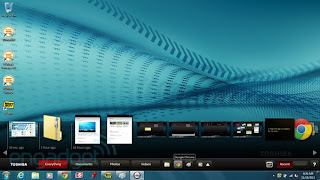 Among these apps is Bulletin Board, which Toshiba has been bundling on its laptops for some time now. With this app, you get a canvas for posting to-do lists, sticky notes and a calendar widget, along with "written notes" (these will be about as legible as if you scribbled them in MS Paint). Any time you want to remove something from this hodgepodge of reminders, just drag the pin that's attaching it to the virtual board, and it'll fade away. It works well enough, though we can still think of some tweaks that would make the app more intuitive. First, Toshiba should pull in calendar entries from Google Cal and other services so that you don't have to manually enter appointments. Also, a local weather widget might be more useful than the analog clock currently included as an option. Moving along, ReelTime opens a scrollable carousel showing your activity on the PC in chronological order. That means apps you've used, documents you've opened and websites you've visited. We can see it being a handy way to pull up things you accidentally closed that perhaps didn't have a quick desktop shortcut. At the same time, though, we're not sure we'd get much use out of this, given that Windows 7 lets us pin key apps, docs and sites -- not to mention the fact that most browsers let you reopen recently closed tabs. Still with us? Good. Because we're not done yet. Toshiba also added Microsoft Office Starter 2010, Windows Live Essentials, Google Toolbar and Google Chrome -- you know the stuff you're resigned to seeing on your spanking new laptop. The $800 configuration we tested, the Z835, is a pre-built version that's only available at Best Buy. To recap, it comes stocked with a 1.4GHz Core i3-2367M processor, 4GB of RAM, a 128GB SSD and a eight-cell battery rated for more than eight hours of battery life. The price goes up if you order through Toshiba's website, but at least the options expand -- a little, anyway. Even here, you'll find pre-configured models, which means you won't have the option of cherry picking the processor or amount of pre-installed RAM. Starting at the low-end, there's the Z835-ST8305 ($880 after instant savings), which comes with identical specs as the Best Buy model, except it costs eighty bucks more. Best Buy's bloatware aside, we can't see why you wouldn't go with the cheaper option. We can only ding a laptop so much for being homely. Once you get past the Z835's dated looks (and you will as soon as you pick it up), it's actually among the best Ultrabooks we've seen. After all, it's earned a bunch of superlatives here: lightest, best battery life and most robust selection of ports (that one's a tie with the Folio). Not bad for $800, especially considering many of its chief competitors cost three, if not five hundred dollars more. If you'll indulge us in a game of devil's advocate, though, we can think of reasons besides the design that you might think twice about this. So far, three competitors (the Air, U300s and UX31) perform markedly faster. Of those, the UX31 and Air each have higher-res displays. And while the Z835's keyboard and trackpad are adequate, the Air's and even the U300s' are better. Still, those seem like minor quibbles considering everything this laptop has to offer at this price. So, if you don't mind the design and dig the price and long battery life, carpe diem! No regrets, we say. And even if you don't take the bait, we suspect you'll soon be seeing more laptops like the Z835: after all, Toshiba has proven it's quite possible to make an exceptionally light, long-lasting Ultrabook that costs well under $1,000. 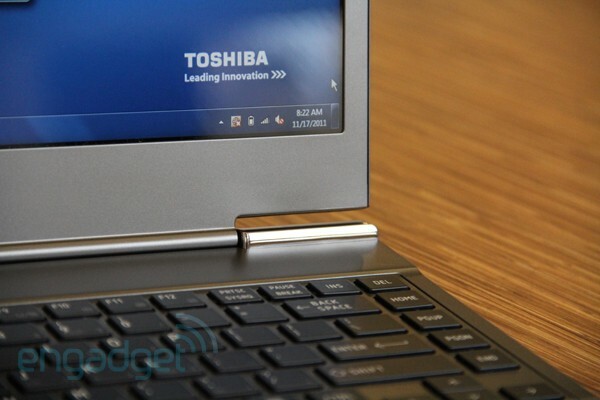 If Toshiba can pull it off, well, everyone else is just going to have to follow suit. Nikon D4 available from January 2012? Euros Media. Picture Window theme. Theme images by sololos. Powered by Blogger.